For eleven years Clay Rivers moved in anonymity as the human animating the costume of the cartoon world's most famous anatine character, Donald Duck at Walt Disney World near his Orlando hometown. “Thanks to his irascible nature, I got in touch with the full range of my own emotions," he says in his memoir Walking Tall: A Memoir About the Upside of Small and Other Stuff. Donning the mask (or in his case, head) gave him insight into the masking he performed personally, compartmentalizing his life into othered spaces: as a black man, as a gay man, as a Christian man, as a man who measures 48 inches tall. Endearingly earnest, with a smile that dazzles as he speaks, he sat down with THE TROVE to share his journey of self-acceptance and his call for tolerance and inclusion. Roosevelt Rivers, a graduate of Florida Agricultural and Mechanical University, an HBCU in Tallahassee, Florida, met Constance Williams while she too attended A&M in the 1950's. Both of modest means, each was the first to graduate college in their respective families. Roosevelt, the divorced father of a daughter, Brenda Regina, would marry Constance after four years of dating. They delayed growing their family until they were financially secure. Roosevelt would become the first black area sales manager in the Southeast United States for Anheuser-Busch and Constance became a teacher and earned a master's degree. Each of their three children together, born four years apart, shared their father's alliterative initials, "R.R." but were called by their middle names, derived from the "C" in Constance, eldest Rodger Clayton, followed by Rhonda Carole, and the baby, Reginald Carlton. Coming from families of six-footers, "Rosey" and "Connie" were surprised by their firstborn's restricted growth but never spoke of it. Although his father was concerned about the challenges his short-statured son would face, Clay's parents raised him with a sense of normalcy that his condition was simply a part of the greater whole that made him who he was. They made adjustments as needed. Visits to orthopedists and ophthalmologists were routine. The retinal detachment and cataracts specific to Clay's type of dwarfism called for three corrective eye surgeries before he even lost his baby teeth. The lovely "Connie" Rivers and her dashing husband, "Rosey" flank their beaming boy, who's clearly delighted by his tricycle. Photos courtesy of Clay Rivers. Through "Mama," his fourth grade-educated maternal grandmother in Miami, were planted the seeds of Clay's abiding belief in God and mannerly comportment. Through Ms. Elsie Adams, who, as his mother's mentor has known him longer than he has, he learned the depth and beauty of one-on-one conversation. She is the first person he told he was gay during his college years. He cherishes his friendship with his sharp, 96-year-old bestie. Clay and Ms. Elsie Adams. Photos courtesy of Clay Rivers. Attending the same elementary school in which his mother taught helped shield him from the taunting or teasing he may have been subjected to elsewhere. He excelled academically if not athletically. Regardless of the sport, he was always the last man standing from the pool of possible teammates during gym class. But by no stretch did not being chosen to participate in something he had zero interest in disturb him. Years later, when in full costume as Donald Duck he'd "hit the ball out of the park" to the tune of "You Gotta be a Baseball Hero" in The Disney World Series at Yankee Stadium. New York Yankees owner, George Steinbrenner and his grandkids were so enthralled with the show that he sent Yankees jackets, hats and baseballs signed by the team to each performer. Gifts from "The Boss," not bad for a kid once shunned on the baseball diamond. After going to public school directly across the street from his family's home, junior high took him to the private Barney Academy on a lake across town where he was the not just the only little person, but the only Black student among a sea of white, average-statured classmates. The navy and white uniforms suited the sartorial leanings of young Clay, who to this day has a penchant for Ralph Lauren sportswear. He went back to public school in eleventh grade at Jones High, where he was was the voted Most Likely to Succeed his senior year and performed in theater productions with a classmate, Wesley Snipes, voted Most Talented in his. Clay became involved in student government, edited Tiger's Paw, the school yearbook, played "the shrill and annoying" piccolo in the concert band, and as an honors student, earned enough credit to begin college as a sophomore. Elected dorm president soon after his arrival at Florida State University, he joined his college mates in donning togas and downing boilermakers—whiskey shots with beer chasers—influenced by the recently released film, Animal House. And the former honors student received a GPA of 0.8 for the first quarter of his college career, a dip from which he would rebound. The communications major hoped to get seasonal work in the marketing department of Walt Disney World while he was home on Christmas break. There were no open positions in marketing, but there was a Donald Duck costume—jaunty sailor's cap and jacket, webbed feet and all designed for someone between three-feet-ten and four-feet-four inches tall. Clay fit the (duck)bill. He maneuvered a hastily taught dance routine and was offered a spot. “The idea was preposterous," he says in Walking Tall. "I was close to finishing my degree. A duck? I never liked Donald Duck. He was too hot-tempered, too mercurial, too moody," he says. Nevertheless, the genial college student wanted the work and on December 26, 1981, he entered the Magic Kingdom, a flirtation which became an on-again, off-again affair for over a decade. Goofy brings out the birthday cake for Donald's 50th birthday during Show Biz Is in 1984. Mickey and Donald visit the Eisenhower Executive Office Building which houses most of the offices for White House staff. Photos courtesy of Clay Rivers. The people in the "Zoo," as the Walt Disney World character office was called, were enthusiastic and welcoming, but Clay soon learned that once in costume, no WDW character ever speaks; the Disney magic untainted by human speech. During his second year at FSU, he was recruited to play the role of the aborigine, Tonga in Paul Giovanni's The Crucifer of Blood amid a cast of theater majors in a top-notch production. Though intimidated, he rose to the challenge, bravely performing a carefully rigged stunt whereby Tonga is shot from atop a ship mast and plummets into the water below. The experience stirred him to switch his major from Communications to Theater and would foreshadow another stunt in his distant performance future. Cast in two other productions including Ionesco's The Bald Soprano, he realized that no matter his proficiency as a thespian, "the roles that would be offered to me would be limited to or based on my height." So he returned to the College of Communications with his mind set on a career in advertising. But to raise more college funds, he returned to the "Zoo" during the summer to reprise his role as the snippety waterfowl in the Main Street Electrical Parade. Performing tirelessly two parades a night, he eventually garnered full-time status as a Disney character. With an impeccable work ethic, Clay executes to the best of his ability, so he decided to ramp up his non-verbal communication, injecting personality into a character from whom no words passed and into whose eyes no guest would ever see. He wanted Disney guests to feel that they'd personally interacted with "the real Donald Duck." And he had the opportunity to do just that in surprising ways. Marketing trips to promote the Disney brand customarily involved goodwill visits to hospitals. Clay's first such trip was to Guatemala, where he was deeply moved by an encounter with a blind child whose smile broadened as she held his gloved Donald Duck "hand" and ran her fingers along the buttons of his sailor jacket, tweaked his bowtie and pinched his duckbill. With her tactile exploration complete, "she laughed a hearty laugh and hugged me as if I were a long-lost friend,” he says in Walking Tall. As a recent graduate, he was ready to take on different responsibilities at Disney, hopefully in design. He felt commodified in the Character Department, frustrated that the company valued him more as a duck than for what he'd studied. He acquainted himself with one of the senior art directors for entertainment and between performances as Donald, he designed logos, brochures, tickets, T-shirts, and show jackets. He had his work samples photographed professionally and presented his portfolio to the design director for Disney World Marketing who had no open position for him but referred him to another design director in Resort Design, where he would ultimately design the amenities packaging (toiletries, etc) used in Disney resorts for over a decade. Photo, left: Kristi Petersen Schoonover; right, courtesy of Clay Rivers. His repetitive knee injuries required surgery, which required downtime to recover, which allowed him time to develop the successful packaging. "Who knew my torn meniscus would’ve given me the opportunity to leave a lasting mark on The Walt Disney Company?" he says. His design solutions were character-driven, featuring the 1950's "pie-eyed" version of Mickey Mouse on black wraparound packaging, "such that when you placed the different items together, they made one giant Mickey," he says. "The idea of black packaging for family and kid-friendly toiletries was radically fresh and we dropped in copy on the back from the Mickey Mouse Club, 'Everybody neat and pretty, and on with the show! '” The amenities were so popular that resort guests would grab them by the handful from the housekeeping carts. Today, unused toiletries with the packaging turn up on E-bay touted as "vintage 1955." As a Magic Kingdom Character, Clay could transfer to Disney-MGM Studios for its grand opening in 1989 and he delightedly took on Gene Kelly's iconic "Singin' in the Rain" number as Donald Duck in the Hollywood! Hollywood! show. But Clay knew he wouldn't be able to waddle on webbed feet forever, nor was that his desire. 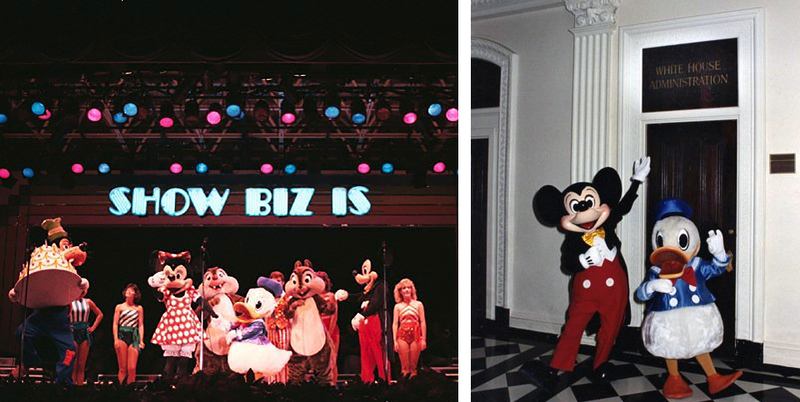 When a position as graphic designer for Walt Disney World Cast Communications opened up, he went for it. His career was looking up but reconciling his Christian faith and his sexuality proved challenging. He'd wrestled with it since having had his first romantic encounter with a man the summer before he started college. Although he came close, he hadn't come out to his family, not fully entrusting that they'd accept his authentic self. In fact, self-acceptance would be years down the road. His father succumbed to cancer in 1994, before Clay could share his truth. It would be four more years before he came out to his mom. Months after his father's passing, Clay helped a friend move across country to Los Angeles. Though he initially had no interest in the City of Angels, he got the idea to make a fresh start. The plan was to pursue work in marketing, but he was in the screen capital, so he went to famed Central Casting and landed a role on the short-lived sitcom, Homeboys in Outer Space. He hated the costume, a leotard, and was grateful to play it anonymously, complete with a rubber alien head. He recalls visiting the theme park, Six Flags Over Texas with his colleagues while on tour for Disney when he was approached by a smiling stranger. "She said, 'You are the cutest little black man I have ever seen!' and pinched my cheek." He was, at the time, speechless. He has since become a vocal essayist addressing social discourse on his blog. 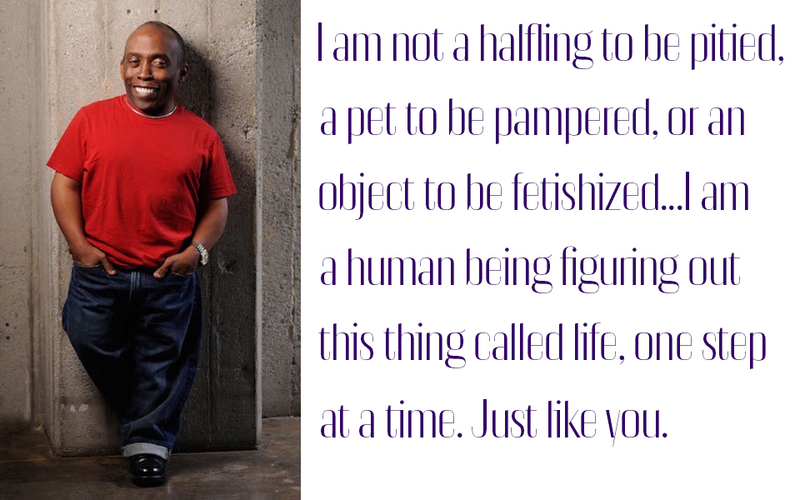 He wrote, "I am not a halfling to be pitied, a pet to be pampered or an object to be fetishized. I am not an inspiration. I am a human being figuring out this thing called life one step at a time, just like you." On the advice of a friend, he went to Coralie, Jr. Theatrical Agency which specialized in "unusual" people. “Coralie had to be at least sixty years old, and came across as one part P.T. Barnum and two parts Leona Helmsley. Her office décor was postmodern hoarder. Nicotine-aged black and white pictures of various circus performers lined the walls. I loathed the circus. There was so much to loathe. People with their faces painted wearing bizarre costumes frightened me. Then there was all that sawdust, not to mention the random rogue elephant stomping or tiger mauling,” he says in characteristically dry humor in Walking Tall. Coralie did, however, book him a spot on the TV show Coach, which happened to be set in Orlando that season. About two years after his arrival in LA, he received an invitation through a friend to attend the premiere of the James Bond film, Tomorrow Never Dies. Wesley Snipes, fresh off the success of his film Blade, was there and spied his high school chum. "At the time I felt totally invisible to everybody," Clay says. "I was still trying to find my way around town and we go there and he's at the party." Clay felt good to see someone from home and to be seen. The old friends embraced and Wesley scribbled his number and told him to give a call. "I was already working at the time at Disney Imagineering, so I wasn't looking for anything, it was just more of a social thing," Clay says. Over a protracted bit of phone tag, they finally connected and Clay met with him and his associates at his beach home. "We just picked up the thread as if no time had passed at all." Before the visit was through, Wesley had offered him a job as Director of Design and Marketing for his burgeoning production company, "basically branding; determining the look and feel of things." "My first year and a half or so in California was really, really hard. I was living in Pasadena and in the Valley, which is a bit different from LA and West Hollywood proper. So to go from the Valley where I was spending 90% of my time to being in the middle of Beverly Hills a block away from Rodeo Drive to work every day was just surreal," he says. Based on an audition he'd had before signing on with Wesley, he received a call offering him a contract to perform in the Chicago cast of the Radio City Christmas Spectacular. He knew that Wesley would not be down with him moonlighting in Chicago, but he felt he had to ask. Wesley's response, “No. You’re either working for me, or you’re not.” So Clay declined the offer only to be offered the LA show just days later, which he also declined. Full-time with work with Wes in communications or a temporary performing gig? It was a no-brainer. In the wake of the dot-com crash, the production company reduced its New York and LA staffs and Clay was laid off in August 2001. He immediately let his agent, Bruce know he was once again available for auditions. Perfect timing. Bruce had a booking ready for an episode of the Nick Cannon Show, wherein Clay would play the member of a Little Person boy band. He checked in with the folks at Radio City and, et voilà, booked the touring show, Christmas Dreams. A three-month gig after having been laid off was a boon. Just weeks after the September 11 terror attacks, Clay was on a plane bound for New York and shaken by the noticeable void in the New York skyline where the twin towers once stood. But he arrived, and got to work, awed by the professionalism of the rehearsals. It was the beginning of a longstanding relationship. Repeatedly offered contracts for the touring Radio City Christmas Spectacular from 2001 - 2006, he booked Atlanta-Cleveland, Dallas-Minneapolis, Seattle-Phoenix, Buffalo-Boston, Pittsburgh-Minneapolis, and Chicago-Boston. Then in 2007, he gets the call “I’m calling to inform you that we’d like to offer you a contract to perform in the 75th Anniversary Christmas Spectacular in New York.” The show would be recorded for DVD and televised on NBC (now showing on Netflix). He would be measured for special elf shoes, made to order by artisans in Brazil, like those worn by Will Ferrell in the movie Elf. He would finally realize a dream to perform in the New York production, the Grand Dame, at Radio City Music Hall. But after the dream, was the nightmare. Flying high in the televised production of the 75th Anniversary of the Radio City Christmas Spectacular. For a scene in Santa’s workshop, an oversized toy plane with a human pilot flies across the stage. Tech rehearsals went fine for the stunt, but during one show the plane suddenly stopped center stage, mid-air. Clay, chosen elf for the stunt, though terrified, remained in character, smiling and waving to the audience below. Then the plane plummeted about twenty feet until the cables stopped the free-fall. "Here I was doing this thing that I wanted to do for ten years and the irony is I could die, I was in this situation where I had no control over anything, but I waved to the crowd trying to be calm. I remember putting my head down and thinking this is SO not what I signed up for," he says dryly. Finally, the Austrian curtain lowered and stagehands rescued him from the failed flight. Thankfully, the fiasco did not occur on the day the show was filmed. Clay found himself roiling with inner turmoil. Finally, he needed to address the depression he hadn't realized he was experiencing and unpack the unresolved issues with and grief for his emotionally unavailable father. The schism between the essential truth of his sexual orientation and his understanding of his Christian beliefs plagued him for all his conscious life. He'd even considered "reparative therapy." But at some point, he knew he couldn't pray the gay away, that he is a beloved child of God just as he is. "I look for meaning in things, not just coincidence, meaning," he says. "So I was in therapy, and I was taking Sam Christiansen's acting workshop on how to find those things that are uniquely you and how to embrace them so that when you go into an audition or are acting, you're not pretending to be someone else; you're bringing all of you to the fore. That's what's going to separate you from everybody else," he continues. He got up one morning and grabbed his book of devotions, Reflections with Ragamuffins, by Brennan Manning, a "defrocked" Catholic priest and recovered alcoholic. The devotion for that day, "dropped me to my knees," he says. He paraphrases the text, "'You're to be exactly who you are and embrace who you are; you are not supposed to be like anybody else. You are the way you are for a specific reason, so your job is to embrace all of that; pull it together and be a unique, shining reflection of Christ. Finding all of those disparate pieces, recognizing them and owning them. God isn't concerned about my sexuality, but with my relationship with him and how I relate to others as a child of God.' That was it, I was done, there was no more having to wrestle." He dipped his toe back into dating with sometimes lovely, other times hilarious results. He recalls giving an accurate depiction of himself on an online dating site and scheduled to meet a 43-year-old gentleman at Starbucks. When he arrived, his date was seventy if he was a day. The film Bad Santa, starring Billy Bob Thornton was casting and looking specifically for a black male little person to portray the Thornton character's sidekick. Clay didn't get the part, that went to Tony Cox, but he was booked as Tony's stand-in until the offer was rescinded and given to Tony's friend instead. That experience along with his first and only film role in 1999's She's All That, soured him to the industry's limitations for little people. "Well, I realize that unless there's some phenomenal part that's gonna be written specifically for a black dwarf, I'm probably not going to get great roles, because of the way casting works." Peter Dinklage's success notwithstanding, "Casting is still restricted and people with disabilities are viewed in a different, restrictive light." Back in Orlando, his passions now lean less toward the performative and more toward the written word. Having taken a writing workshop, he crafted two award-winning screenplays Fur, and Christmas Is, the latter he has since re-imagined as a novel, his first after authoring three books of non-fiction. Industrious always, Clay learned to code ebooks to produce his memoir, Walking Tall: A Memoir About the Upside of Small and Other Stuff, The Rain Dancer: Finding the Joy in the Storm and 3 Things I Know, each written, edited, art directed and designed by Clay. After writing three non-fiction books, including his memoir, Walking Tall, Clay made his foray into fiction with Christmas Is. Of the madcap, Yuletide romp through the bustle of Broadway that is Christmas Is, Clay says, "If I had my druthers, it would be great to have Kevin Hart as Franklin (lead character in the novel and screenplay) and have somebody take it and go!" "Over the past couple of years, I've developed a modest following on Medium, writing about race. Shortly after Trayvon Martin and the whole spate of brutal events, I was having conversations with my friends, white, male friends about race in America and I found myself saying the same things over and over. I decided, let me just write this down, an essay, a blog post about it. 'How I Talk to White People About Racism' and people were reading it and clicking and responding." It was picked up for the New York Times series A Conversation on Race. Whenever he wrote about other topics; readers were less responsive, so he has unintentionally become a social critic, writing about race in America, though still commenting on matters of faith and personal growth. He struggled for words in the aftermath of the massacre on June 12, 2016, of 49 people at Pulse, the LGBTQ Nightclub, 15 minutes from his home. "Terror happened practically in my backyard." As he raises his voice in outrage, he stands rooted in love, taking deeply to heart Christ's command to "love one another." He'll continue to publish, his publishing imprint Constant Rose named in homage to his parents. He's made peace with his late father, mourned the revelatory moments they'll never share, and come to know that the aloof father who bore the heavy burden of racism and drank to dull its edges was the same father who once suffered second and third-degree burns to save his family from their burning home. He contained multitudes. And now his son can embrace all that he was as he moves forward with the mantra, "Embrace all that you are and strive to become all that God created you to be." 1. Paris, France. "I first fell in love with all things French in seventh grade, thanks to a crush on my French teacher. In college I became a certified Francophile, as I feasted on art history, music appreciation, and western civ courses. I didn’t actually visit France until I was forty years old and fell in love with the sights and sounds I had only read about. The French embellishment and elevation of everyday objects from the mundane to magnificent pretty much cemented my affinity for France." 2. Faith. "A belief in the triune God has done more to shape who I am more so than anything else. While my spiritual journey has taken me to a number of denominations, it has always kept me rooted in the conviction that there is so much more to life than we experience with our five senses. Belief that I’m not out here on my own spinning my wheels." Clay's cherished Tiffany & Co. sterling crosses are emblematic of his faith for sure, but they also represent clean, classic design. 3. Good design. "Consumer products, graphic design, packaging, architecture. The glory is in the details. Good design speaks influence as a native tongue so fluently that oft times the heart or mind perceives the intended message or function as intuition before it realizes the thought was planted by the designer." Cocktail by Elliott Clark at Apartment Bartender. Cioppino from The Daily Meal. 4. A well-made cocktail. "There’s nothing like a well-made, handcrafted cocktail to polish off the day’s rough edges." 5. Cooking. "From shopping for ingredients to preparing the mise en place to plating the meal, cooking is therapy for me. The methodical working through a process to a desired end rejuvenates me." 6. Mont Saint-MIchel. Le Mont St-Michel, depending on the tides, is either a peninsula connecting by causeway to the Normandy Coast or an island with a "well-preserved medieval village," lorded over by a steepled abbey church reminiscent of the Magic Kingdom's Fantasyland Cinderella Castle. Clay was taken with the classic examples of Gothic and Romanesque architecture in the monastic complex. Samuel Jackson Pollack, known as "Jack" was Clay's second Bichon Frise; the first was "Bailey." Photos courtesy of Clay Rivers. 7. Dogs. He's not partial to all but rather, "small to medium-sized, cuddly, friendly dogs. The unconditional love of dogs is one of the great joys in life." 8. Knitting. "Creating garments for loved ones is but half reward. The expression on the recipient’s face balances out the equation. I don’t knit gifts for everyone, only those who appreciate the time and effort put into creating a one of a kind item." 9. Classic R&B. 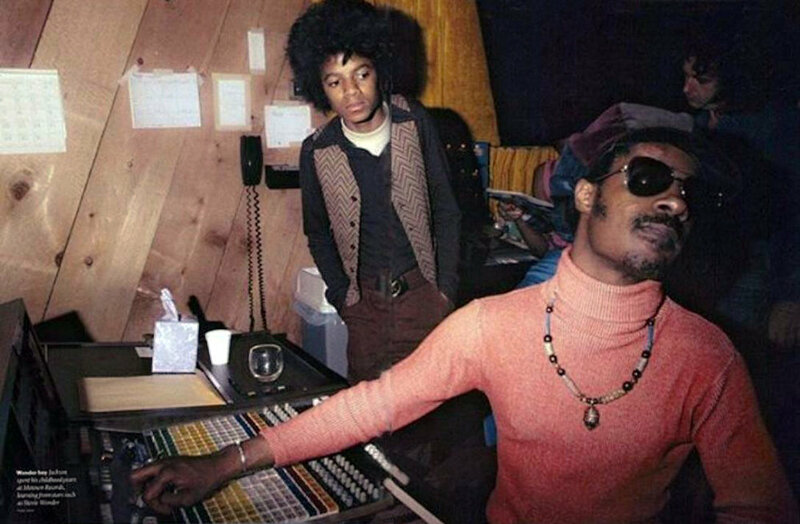 "Classic R&B from the 60s, 70s, and 80s are the best mood modifiers I know of. Music by Stevie Wonder, Earth Wind & Fire, Michael Jackson, Aretha Franklin, Prince, and so many more take me back to my childhood when my understanding of the world was not weighted down with all the pressures of adulthood." 10. NYC. "The greatest city in the world. New York holds so much that I adore. It’s the pinnacle of all that is America. Art, culture, energy, food, sports, and a myriad of people from all over the world, all living in 23 square miles."